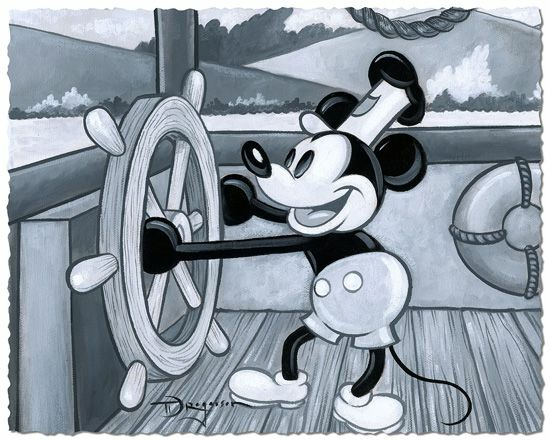 Tim Rogerson Limited Satin Finish Print on Hand-Deckled Paper:"Willie at the Helm"
Edition: Artist Signed and Numbered / 195 limited editons with COA. About The Artist: As a rising star in the art world, Tim Rogerson casts his artwork with a very evident energy and passion. Inspired by the works of Edgar Degas and Malcolm Liepke, the North Carolinanative has embarked on an artistic journey that has taken him from Degas to Disney to darling of the industry. Mr. Rogerson grew up living the everyday life of a kid, playing outside and "hanging out" with friends, however, the artistic urge to create was always present, compelling him to apply the pictures and images in his head to paper and canvas. Every child has a dream. For Mr. Rogerson, it was to be an artist as well as satisfying his desire to return to his home-state; back to the magical kingdom from which he came. Of course being surrounded by the whimsical images of Disney characters, even after his family moved to North Carolina; his father was an avid Disney collector and supporter, didn't help curb his appetite for the Sunshine State. However, it was these images that helped form some of Mr. Rogerson's style, which has begun to earn him critical acclaim. Fulfilling his dream of returning to Florida, Mr. Rogerson was accepted as a student at the prestigious Ringling School of Art and Design in Sarasota, majoring in Illustration. "I was a very traditional art student and explored all works; from the old masters to modern art," says the artist. "My influences include Degas and John Singer Sargent; with his perfect, confident brushstrokes...their work has allowed me to push the envelope with my own abstraction of life. Using the medium of oil paints, Mr. Rogerson focuses on capturing people in social settings, My work will always evolve, becoming more complex and detailed, says Mr. Rogerson. While studying at the Ringling School, Mr. Rogerson gained the reputation as an upcoming artist and influence in his own right. His unique style was recognized when he was awarded the 2003 Best Painter Award from Ringling, followed by 2003 and 2004 Best of Ringling Award. One of his recognized works was an emotionally powerful portrait of Mr. Lincoln. Since graduating from Ringling in 2004, Mr. Rogerson has contributed his artistic abilities to Disney and SS Designs in Florida. Currently, Mr. Rogerson is taking the art world by storm with his whimsical imagery for Disney Fine Art and this summer's launch of Tim Rogerson's Cosmopolitan POP: A Series of Paintings About Everyday Life and the Games People Play; a series of collections of works that showcase the lighterside of life. "I want my paintings to celebrate life and stay fresh... I try to stay away from the basic routine and technique because my joy for painting comes from the challenge of creating something entirely new," says the artist about Cosmopolitan POP. In preview, this series has already won critical acclaim by the trade and his peers. Mr. Rogerson's latest success has come in the form of an official title. Named an Official Artist of the 2006 U.S. Olympic Winter Team, Mr. Rogerson has taken the POP world by surprise again with his colorful and impacting style. Tim Rogerson has obtained this designation by working with An Official Licensee of the U.S. Olympic Committee, Fine Art Ltd.
Rogerson's piece titled "US Olympic Winter Team 2006" will be released as both a limited edition giclée in an edition of 250 and an open edition poster. His contribution will help support the U.S. Olympic Winter Team. Throughout history, the Olympic Games have been a forum for nations to peacefully compete for the prestige and honor of gold medals. U.S. Olympic Winter Team 2006" is an ode to the American men and women who are competing peacefully in the 2006 Olympic Winter Games during such a volatile time in our history. From the graceful glide of the ice skater to the speed of the bobsled and determination of the downhill skier, Rogerson's piece represents the passion with which the U.S. Olympic Team hopes to bring the gold home to the Red, White and Blue. As my personal style is emerging and I break down the composition into simple shapes, with each shape having its own palette it's a jigsaw puzzle of color to form an image, says Mr. Rogerson. Tim Rogerson's publishing company, Collectors Editions, is a global art publishing company dedicated to providing the highest quality fine art and services available in the industry. Founded in 1986, they are also the exclusive global publisher of Disney Fine Art. Home to Eclipse Workshop, whose master printers are specialists in fusing traditional print-making with cutting-edge process, Collectors Editions is painting a better canvas for the art world...one brush stroke at a time.